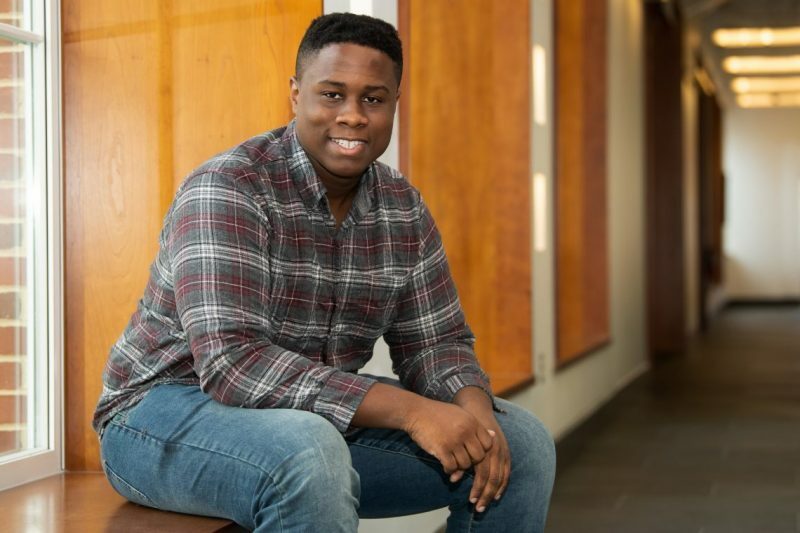 ‘Fight for Change and Progress’ Dannick Kenon '19, who plans to attend law school and devote his career to positive social change, has co-founded a new student publication at W&L called The Vigil. I chose W&L because of the location and the small classroom sizes. I grew up in a northern suburban area and I wanted a change of pace for college. Washington and Lee is a perfect fit with its small-town vibe and beautiful Appalachian mountains. Besides the Lexington coziness, the small classroom sizes really stuck out to me. I remember on my first visit to the school there were classes with only three people, compared to other universities with up to 200 people per class. You are pursuing an interesting combination of majors and minor. Why did you choose those areas of study? I originally came to Washington and Lee as only a politics major. In high school, I loved my AP politics class and have always enjoyed arguing politics both inside and outside the classroom. Having seen the role of finance and business in policy, I decided I need to gain a deeper understanding of money in general. Accounting, the language of business, served as a great fit because it showed me how people analyze and think about the exchange of money. I chose the poverty studies minor because I wanted to learn about how economic insecurities affect political issues, especially criminal justice. What internships have you held, and did they reaffirm your future career goals or cause you to rethink the path you want to take? Over the past three summers, I have interned for the Dwayne Gregory for Congress campaign, the Office of the Public defenders in Baltimore, and Washington and Lee’s Office of Sustainability. All three contributed to my decision to attend law school. Witnessing firsthand the role that law and policy play in politics, criminal justice and sustainability taught me that I need to grasp a better understanding of the law to truly fight for change and progress. You serve as co-founder and chief strategist for The Vigil, a new publication at W&L. What is The Vigil and how did it come to exist? The Vigil is a student publication dedicated to telling opinions that traditionally have not had representation on the W&L campus. We publish many diverse pieces, from black poetry to the importance of the W&L community. Our goal is to give Washington and Lee something that will be an atypical point of view. It came to exist when co-founder Jake Sirota and I, along with a couple of other student activists, decided it was time to get our voices heard. What does your job as chief strategist entail? My job is to set the agenda and gather the resources to maintain The Vigil. This can go from gathering articles from different student activists to helping set up a podcast, so we can shine a light on the diverse W&L student leaders. Another big part of my job is recruiting editors, managers and whoever else we need to the executive team. Why is The Vigil so important to you, and why do you think it’s important to the W&L community? The Vigil is important to me because it gives activists and students of color the ability to be heard on a campus that can often seem like it caters to only one type of student. I believe it is important to the W&L community because it stands as a force to move Washington and Lee in a direction of change and progress that this university so rightly deserves. What other extracurriculars are you involved in at W&L, and why? I am the treasurer of Amnesty International, the treasurer of SEAL and a member of compost crew because I believe in both the protection of human rights and sustainable practices. I am also a shift leader for Campus Kitchen at W&L and an advisor on the Shepherd executive committee board as a way to further my studies in the field of poverty. “Locking Up Our Own: Crime and Punishment in Black America” by James Forman Jr. This book details how we grew to such a high mass incarceration rate, especially among black men. It shaped the way I viewed the justice system as well as the black community in America. How much I would miss sleep. Taking on the role of a police officer in the Volunteer Venture Poverty simulation. It was a great learning experience for both myself and the first-years in studying poverty. My favorite class was POV-296, Freedom and Unfreedom, which took place inside Augusta Correctional Center. It was the first class to truly introduce me to the flawed criminal justice system, and my first chance to actually meet people who have been incarcerated and to learn from them.